Mr. Shims "U" shaped structural shims are lightweight but strong enough to withstand tons of compressive force. Assures convenient leveling and alignment for the glass and construction industry. Mr. Shims Structural Shims are available in 5 sizes, Interlocking 1-1/2" x 3" and 3" x 4", Non-Interlocking 1-1/2" x 2", 2-5/16" x 3" and 1-1/2" x 3-1/2". Three standard thicknesses, each with its own color for quick, thickness indentification. 1/16" Blue, 1/8" Red and 1/4" Black. New Assortment Kits Available see Below. Non-Interlocking Shims: Three sizes three thicknesses. Interlocking Shims: No Matter how you stack em these shims stay together! Shim Asstortment Kits: Non-Interlocking and Interlocking. 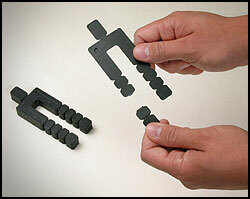 Stackables: Just snap off the individual shims to get the size and thickness you need for the job at hand. 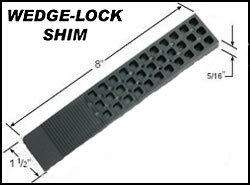 Wedge-Lock Shims: Designed to maintain alignment when compressed together. Specification Sheet: On Polystryene, for Interlocking, Stackables and Wedge-Lock Shims. If you're looking for cost saving solutions to your building needs. 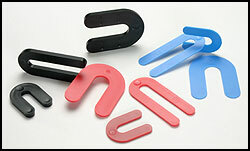 Mr. Shims can provide you with the highest quality shim products available. Engineered with the installer in mind. Traditional wood shim products have long been used in the building industry and present a variety of limitations  rotting, shrinking and swelling. Mr. Shims reduce material and labor costs while providing a secure stable solution to your shimming needs. Leveling; i.e. appliances, furniture, etc. Our assortment kits are enclosed in a heavy duty cardboard box. Inside are placed 100ea of the 1/4", 1/8" and 1/16" with dividers. A handy way to take them to the job site. Kit = 100ea 1/4", 1/8" and 1/16", in a carrying case. 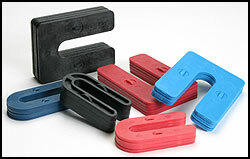 These shims will simplify the use of multiple shims in your application. Snap off the individual shims and get the size and thickness you need for the job. Made of High Impact Polystyrene. Comes 63 shimstacks 1008 shims per case. Designed to maintain alignment when compressed together. Whether shimming cabinets, floors or windows, the WEDGE-LOCKs Unique locking system will optimize job when placed together.